In some fans’ minds, it seems that Ryan Newman is the new public enemy number one as the the season-finale and the one-race Championship round at Homestead-Miami Speedway approaches. Is it a fair assessment, though? We’re all entitled to our opinions. I’ll give everyone that. But did Newman really do anything wrong? In my opinion, I don’t think he did. For those who didn’t see Sunday’s race at Phoenix International Raceway, the ire-catching move came on the last lap when Newman drove down on the apron and then washed up, making contact with Kyle Larson. 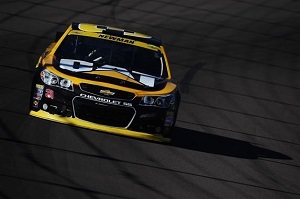 As a result, Newman bettered his running position and finished 11th. That 11th position just barely got Newman into the Championship round, bumping Jeff Gordon, who finished the race second to winner, Kevin Harvick. Critics of the move/pass by Newman on the final lap seem to adamantly believe that Newman hit Larson on purpose. Honestly, I don’t see it that way. The way I see it, Newman saw somewhere he could go to possibly increase his position, i.e. the apron, and it worked for him, but for Larson, not so much. And for the record, although Larson didn’t like it, he understood it. Here’s what he said after the race. Not to beat a dead horse, or bring up a worn out topic, I guess it’s sort of like the Brad Keselowski/Gordon incident from a week ago. Like Newman, Keselowski saw a spot and he went for it. The incident at PIR just didn’t include a big brawl at the end. But then again, Gordon clarified last week that his beef with Keselowski wasn’t, necessarily the move on the race track; instead, it was Keselowski’s refusal to discuss it with him after the race. Interesting note, though, and maybe a little off topic, but had it not been for the Gordon/Keselowski incident, had everything Sunday at Phoenix played out the same way, Gordon would be advancing, not Newman. And here we go, back full circle to Keselowski again. I’m guessing he’s not on Gordon’s Christmas card list this year. To be clear, I was just injecting some humor, there. I also see the Keselowski situation as hard racing and perfectly fine.